Select the files and/or directories that should be exported and decide whether the files and/directories with identical names should be overwritten without warning or whether overwriting should be confirmed or whether the files and/or directories with identical names should not be overwritten at all and also decide whether the sandbox should be cleaned before export. Specify the following three items: CloverDX Server URL, your username and password. Then click Reload. After that, a list of sandboxes will be available in the Sandbox menu. Select a sandbox. Then click Finish. 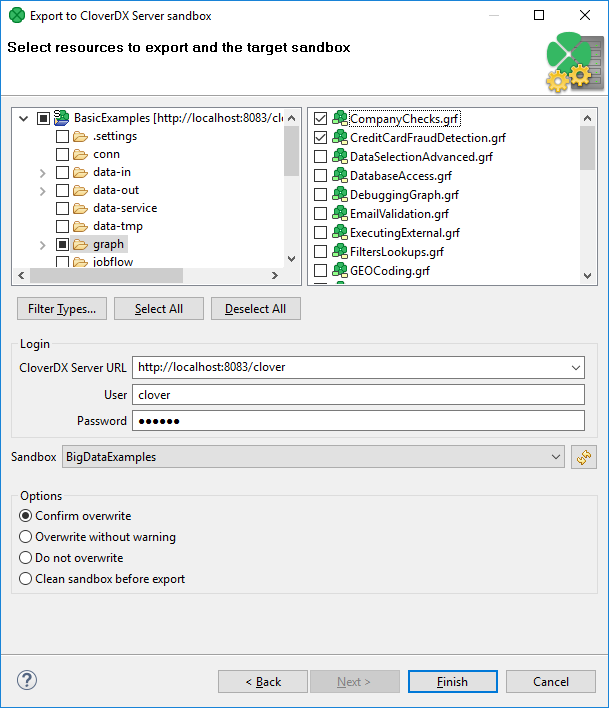 Selected files and/or directories will be exported to the selected CloverDX Server sandbox. Exporting to a partitioned sandbox is not supported. Since the sandbox location to be affected is not known in this case, the action returns errors.